Wash and dry the okra or wipe with a wet cloth. Cut both the ends and cut into two inch pieces. Heat the oil in a wok and add the mustard seeds. After they pop add the cumin seeds. When they change color, add the onions and saute till light golden. Add the green chillies and saute for half a minute. Add the okra and roast for 10 minutes. Add the chopped tomato, red chilli, coriander and turmeric powders. Mix well. Cook covered over low heat stirring occasionally. Add the salt and amchur powder. 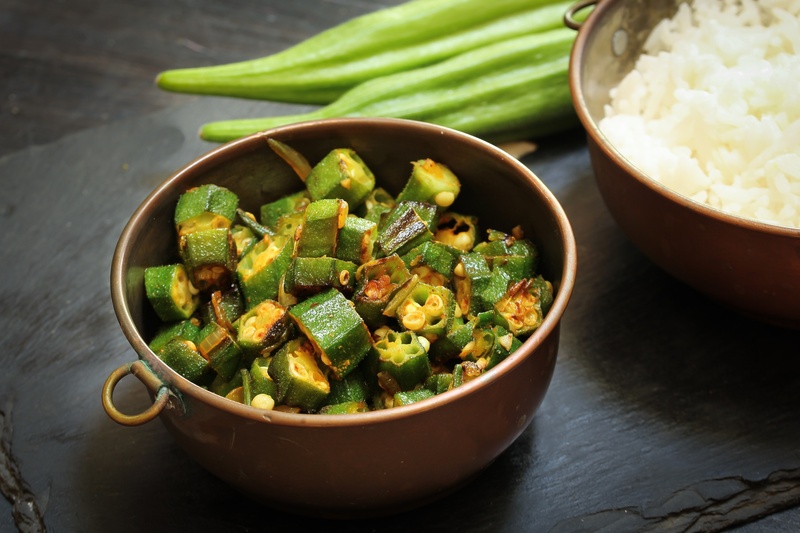 When the okra is almost cooked, increase the heat and cook for two minutes more.